It feels like a minor, incidental scene. A slave wanders into a store where the free-born Solomon Northup is shopping with his wife. The slave is quickly followed in by his owner who apologizes for the intrusion and hurries him out. Northup and the white shopkeeper barely react and carry on with their transaction. That scene has stayed with me. 12 Years a Slave is a brutal viewing experience. The audience I was part of took longer than usual to rise after the show ended. I think we all needed to regain our sense of the present after being sucked into the treacherous swamp of what was the experience of slavery in the American South less than 200 years ago. Climbing out of that swamp was especially difficult because of the weight of questions to which there were no ready answers. How could they? How could this kind of brutality be a part of the not so distant past of a country that prides itself on its freedoms? Where was the church when all of this was happening? Today we express shock at the high level cover up of sexual abuse in the church.Yet is this so new? Or is it just another expression of how the teachings of Jesus, the faith by which we say we live, has become disconnected from what the institutional church feels obliged to uphold and protect? We are appalled by slavery then—but not enough by the structural enslavement today of the vast majority by a super-rich minority. Not appalled enough to raise the minimum wage in America or resist chasing ever cheaper labor in the newest, most desperate third world country. Once banned from teaching by the Vatican, liberation theologian, Prof. Leonardo Boff believes Pope Francis will change the church. 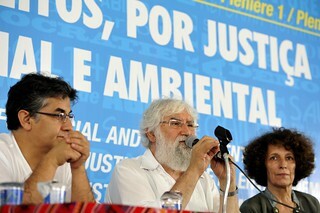 (Photo credit: CIDSE – together for global justice). Many have argued that we would have a very different kind of world if we thought about the teachings of Christ less in terms of what has come down to us from the Mount and more in terms of how we are called to act on the level plain of simple fellowship and equality. The Homeless: Today’s “Slaves”? If we did, perhaps we would look at the homeless differently. Perhaps we would be better able to see the homeless as people who deserve our recognition and attention, not just conscience-salving charity. Remember Detective Goren on Law and Order: Criminal Intent? He had that odd way of bending his body around his subject, looking at them up close from unusual angles to take their measure. And let them take his. Perhaps we need to imitate him. Change our angle of vision. Alter our perspective. Become uncomfortable. It might make us less inclined to see the homeless as fleetingly uncomfortable obstructions on the sidewalk. Or briefly guilt-inducing accusers with whom we try to avoid eye contact until the traffic lights turn green. Perhaps then they might register on our consciousness more fully than the errant slave who wandered into the store registered with Solomon Northup and the shopkeeper.